Two days of deadly flash floods from torrential rainfall has killed 14 people in southern Europe. 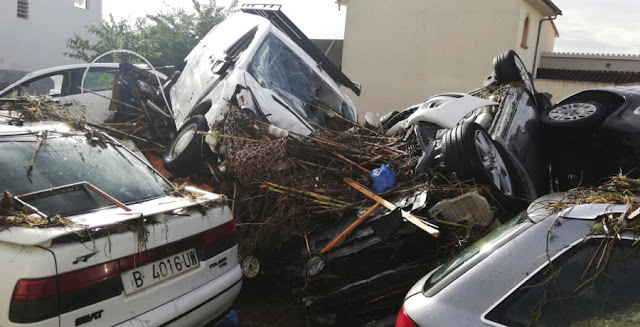 Flash floods caused by torrential rains killed at least 10 people on the Spanish island of Majorca and burst the banks of a river, washing away vehicles and engulfing a town in muddy water. Hundreds of emergency workers, with the help of helicopters and sniffer dogs, were searching throughout the day for other victims, and one child was still missing as of Wednesday evening. The flood hit Tuesday night and cut off the town of Sant Llorenç des Cardassar, which is home to about 8,000 people and is about 40 miles from Palma, the island's capital city. In Italy, the Cagliari area of Sardinia was also hit by bad weather, and one woman was found dead on Thursday. Her car had got trapped by the flooding. Italian news agency Ansa named her as 45-year-old Tamara Maccario and said she and her family had left their home near a river over the fear of the impending floodwater. The vehicle was swept away at about midnight on Wednesday. Ansa reports that one of the woman's daughters was found clinging to a tree, while two other children and their father were found in two separate homes nearby. Ms Maccario's body was found on Thursday morning. Another man was also reported missing. Large parts of Cagliari remain underwater, demonstrated in a video posted by Italian firefighters. Roads and bridges have also been damaged. Dozens of people have been evacuated, and several roads have been closed due to either collapse or dangerously high water levels. In southern France, the rise of the River Garonnette in Saint-Maxime swept five cars towards the nearby sea. Two bodies were found in one of the cars, which had been tossed upside down in the water. Saint-Maxime lies in the Var region, where local authorities had urged people not to take to the flooded roads and to seek shelter during the heavy rainfall. According to the BFMTV news site, 210mm (8in) of rain fell on Wednesday night - two months' worth of normal rainfall.